This heap is the one currently being filled and so is ‘working’. As with all our heaps (7 in total) it is covered with black plastic, but also, underneath the black, is one of our compost bin lambs wool duvets. Although its pretty cold outside the heap is still working, and is full of worms munching away. 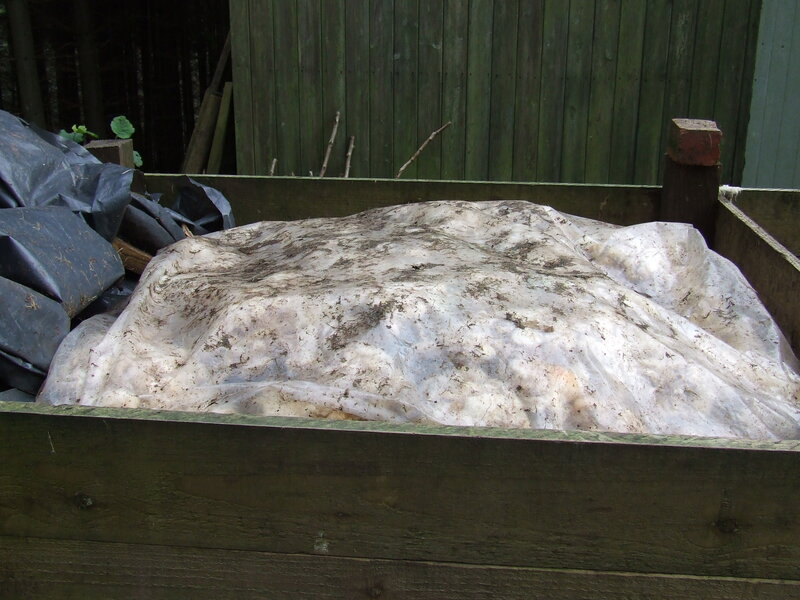 And here is what a (slightly mucky) compost duvet looks like in real life, with the top black plastic cover pulled to one side. The filling is unwanted lambs wool shearings from a local farmer – very green! If you live local to us, I can supply a limited number for a small fee. Use the reply/ comment form at the bottom of the page to get more details The basic size is four foot square, although other smaller sizes are possible, as this is the bin size we find best suited to making good compost.